← Sandra Balzo. Dead Ends. Sutton, Surrey, England: Severn House, 2012. J. Leon Pridgen, II. 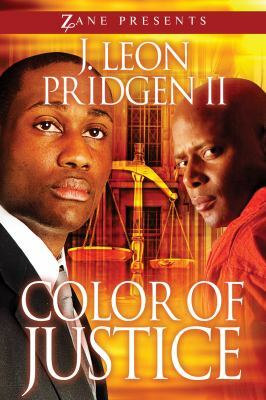 Color of Justice. New York: Strebor Books, 2011. James Pruitt grew up with the security that every child deserves. He knew that he was adopted, but his adoptive parents, William and Mamie Pruitt, always made him feel like he was their own. Their love, and the careful guidance that he received from them, has helped him to succeed in school. As this novel opens, James believes that he has the inner strength that will allow him to be successful in his career, begin his own family, and handle whatever life throws at him. Have brother …. Help him. James has no idea what his father’s final words could mean until he finds a box of newspaper clippings and photographs in William’s closet. Only then does Mamie tell James about his parents and that his birth mother had another son–a man who is now on death row. Warren Johnson isn’t pleased when James comes to see him in prison. Warren resents the easy life that James has had and he thinks that the man who raised him, Geoffrey Taylor, is doing all that can be done to save him. James, a lawyer, has a bad feeling about Taylor, and his prosecutor’s instincts won’t let him accept Warren’s case at face value. Although it upsets his mother and strains his relationship with his girlfriend and his boss, James and his friend Chuck race to clear Warren’s name, no matter what the cost. Despite the dirty dealings that James and Chuck uncover, this well plotted novel is at heart a warm story of family and loyalty.